This post did not generate many responses but I am still trying to figure ou what to so I thought some pictures may lead to more interest. 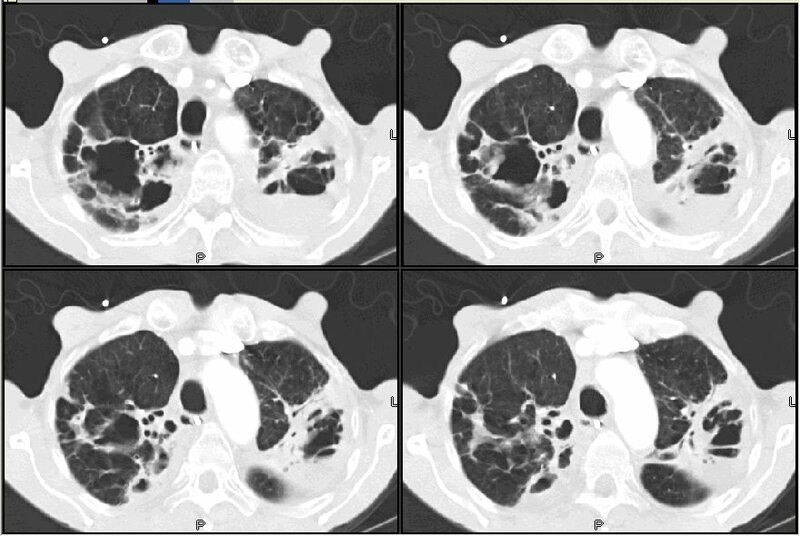 This is the man with COPD with B/L upper lobe M. kansasii infection now with hepatotoxicity secondary to INH+RIF. He has some failure to thrive and looking below it is easy to see why: his upper lobes are kind of "chewed on". Any experience/suggestions on Tx of M. kansasii? 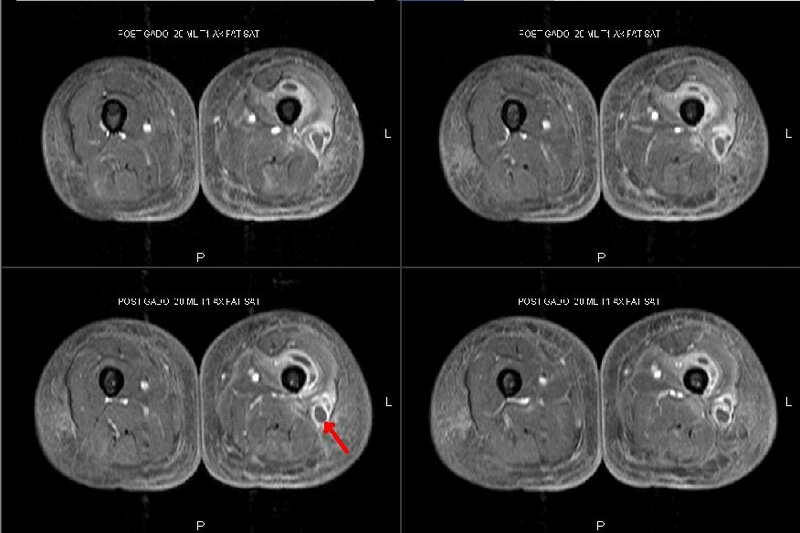 This is in follow-up to the young woman with the leg pain. There were few comments but they covered several of my concerns. The V/Q was low prob with negative dopplers as noted. 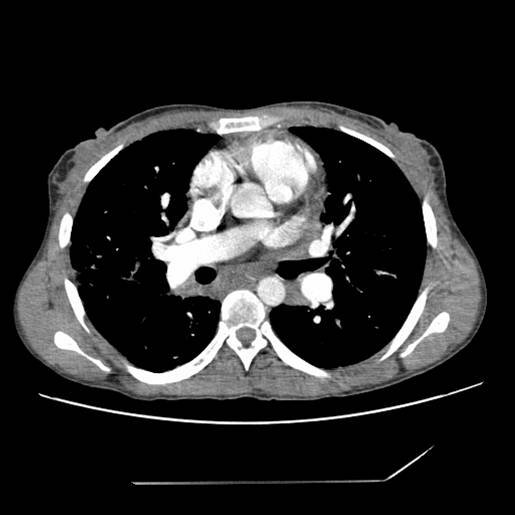 The pleural fluid was consistent with a non-complicated parapneumonic effusion. The final answer was on the leg. Mike raised some concerns about osteo. 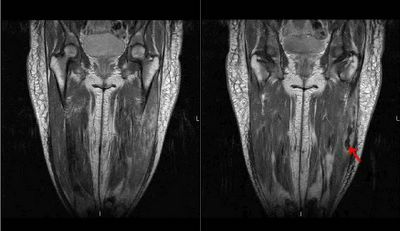 Since her leg was indurated at a deep soft tissue level I was more concerned with the possibility of pyomyositis. Pus in the muscle is fairly rare (also known as "tropical pyomyositis") but there is an increased incidence (with spontaneous muscle necrosis) in diabetics. 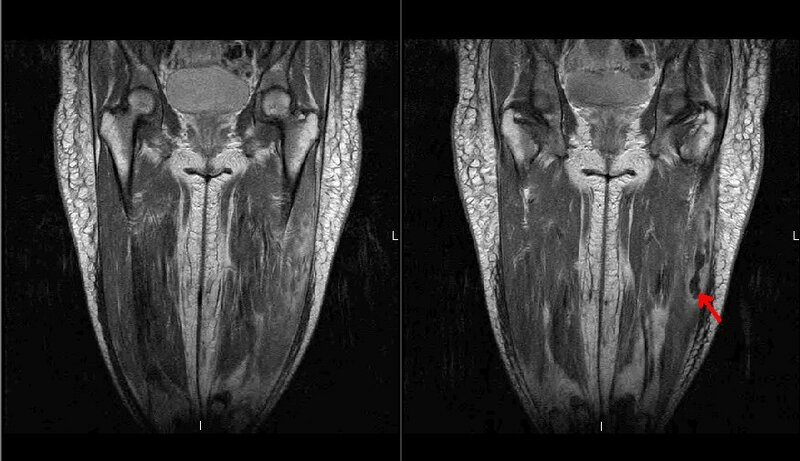 I asked for an MRI of the leg and I marked the enhancing areas within the thigh with the arrows below. I had posted the CxR on this 68 y/o man back in May: he had COPD and B/L upper lobe disease with M. kansasii. 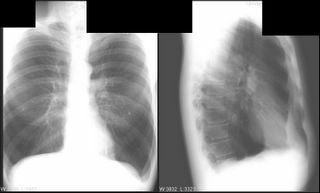 He was started on INH/RIF/ETH and did fairly well: cough resolved and his CxR improved. However he came to the ER last night with some confusion, N&V and FTT. His AST was ~300 with ALT~150 (ammonia was only 5). We have held his meds. 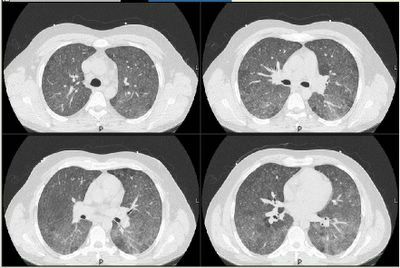 I suspect that, similar to TB Tx, I will be able to reintroduce them at a lower dose and monitor. However, in case I cannot reintroduce the INH, any experience with or suggestion of alternative regimens? This was a long case so I will give you the highlights and try and steer you towards the interesting parts. 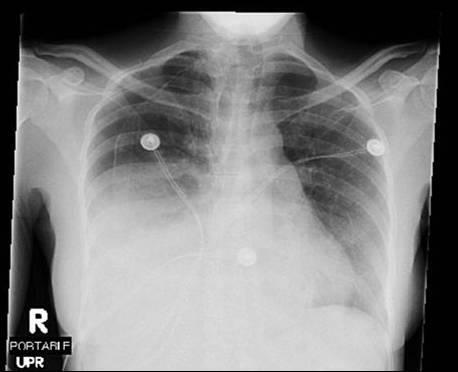 We were asked to see this 34-year-old woman for chest pain, dyspnea and persistent fevers. She has a history of adult-onset type I diabetes and presented with significant body aches, pains, fever, loss of appetite and was found to have diabetic ketoacidosis. She was admitted to the intensive care unit, started on aggressive fluid resuscitation and glycemic control with insulin. Her DKA resolved completely. On admission, she had 1/4 blood Cx bottles + for Staph. aureus (MRSA). 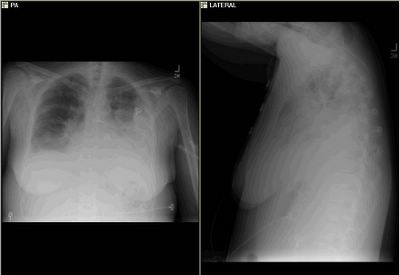 She had a small L pleural effusion, was given ABTx and a 2-D-ECHO was negative for vegetations. On the day of this consult, she was much improved but still has some pleuritic chest pain. This was more pronounced on the left but she described it radiating across the chest. No significant cough. No throat soreness. No dysphonia. She also had some diffuse mild abdominal pain and diffuse mild abdominal tenderness. No nausea or vomiting. She complained of let leg pain and could not weight bear. On exam, she appeared ill, was febrile. HEENT was unremarkable. She had a L pleural rub. Cardiac exam was unremarkable. Abd was diffusely tender with no focal findings, no guarding or rebound. Her left thigh had normal skin but the lateral aspect felt almost indurated to touch compared to the right. No erythema, no rashs, no warmth and only tender to deep palpation. I reviewed her data and she had had intermitently + blood Cxs for Staph aureus (2/6 bottles) and a urine Cx also + for MRSA despite a few days of IV vanco. 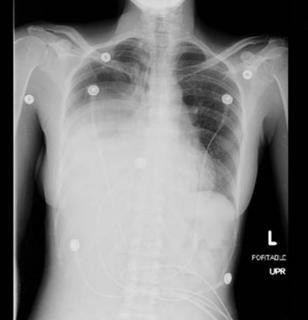 Her CXr is seen below. They had already done a V/Q which I have attached. All those deffects are matched. What would you do next? What is your DDx? Mrs. A is a 34-year-old African-American female with multiple ER visits for pain and also diagnosed with heart failure. 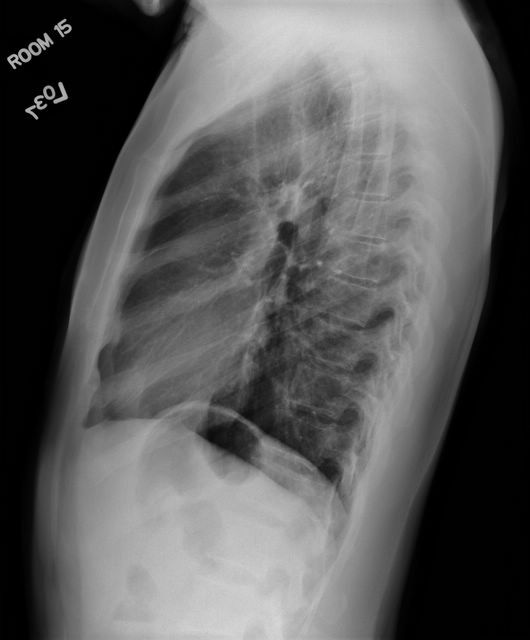 She presented with lower extremity edema, increased abdominal girth, and chest x-ray with some interstitial markings. CT scan of the chest (performed for PE). 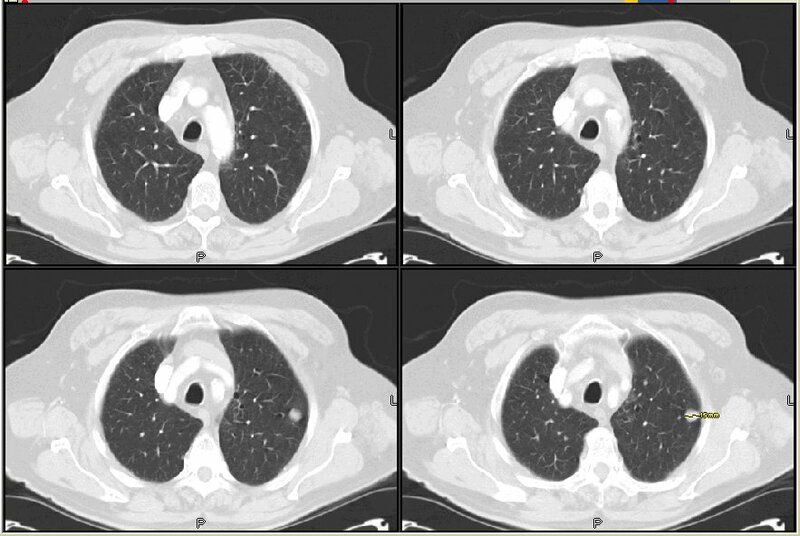 She has dyspnea on exertion which is not prgressive as per patient. SHe requires home O2. She also has a nonproductive cough. She has noted splenomegaly and pancytopenia for over 10 years when I contacted him. She takes no medications. Currently she is not compliant with oxygen. SOCIAL: smokes age 21 to 28 one PPD. She drank approximately 6 drinks per day from age 21 to 25. She has never used inhalational or IV drugs. I have specifically asked if she used crack cocaine, inhaled heroin, or IV drugs. She denied all the above. She is not married. similar to my prior evaluation in the hospital. echocardiogram 5/22/2005 - PA pressure 48. Normal EF. Mild tricuspid regurg and she has a dilated right ventricle. Her bubble study was positive. WBC 1.9 with 84% Neut. Hct 32 with MCV 74. A. Lung, endobronchial biopsy: Active chronic inflammation. See comment. There is active chronic inflammation in specimen 'A' with squamous metaplasia. A single subtle granuloma is seen in 'B'. 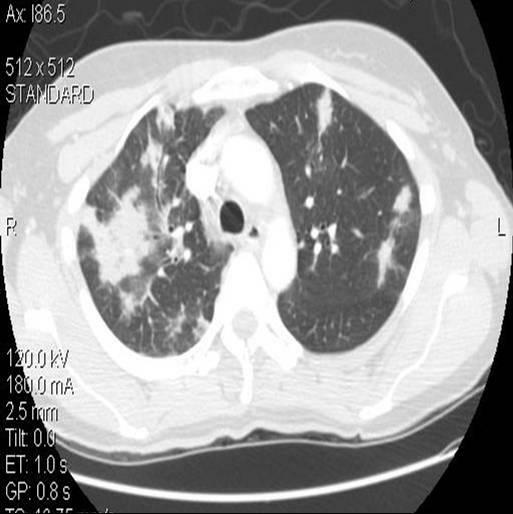 The histologic appearance is not characteristic of sarcoid. The histologic findings favor an infectious etiology. 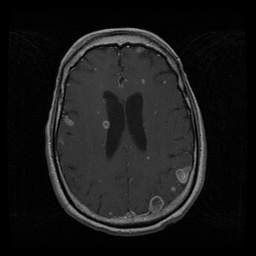 Any thoughts on diagnosis and suggestions for further investigation (especially in light of the interesting TBBX interpretation)? What do you think about the elevated transaminases? 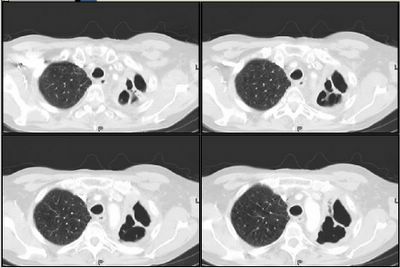 53 Y/O F with no significant PMHx presented to her PCP 8 weeks ago with nasal congestion, post nasal drip, dry cough and low grade fevers. 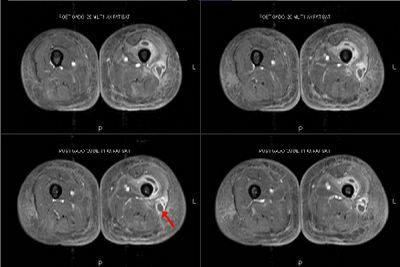 Her symptoms persisted and she was treated with a course of azithromycin with no improvement followed by a course of levofloxacin. Her cough gradually worsened and remained dry, and her fevers continued with temps to 101 F at home. 2 weeks ago she developed dyspnea on exertion with climbing 1 flight of stairs. No other associated symptoms including rash, arthralgia, chest pain, LE edema, neurologic Sx. No Pets, no significant exposures, no HIV risk factors, no recent travel outside US, no sick contacts, no weight loss. Prior to 8 weeks ago she was asymptomatic and ran 4-5 miles 3X/week. PFT: FEV1 1.86 (72%), FVC 2.53 (74%), FEV1/FVC ratio 97%, and room air saturation 96%. 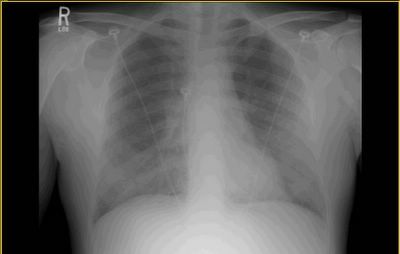 What do you think the DDx is and how would you proceed. 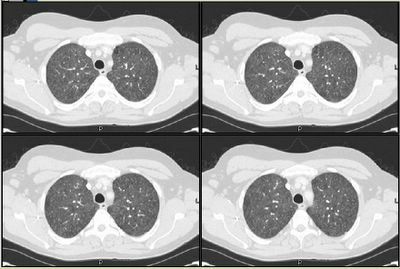 Latent TB or not latent TB? Guidelines for handling a positive PPD is to get an xray to see if it is abnormal. Presumably, this is to rule out ctive TB so you would then treat with 4 drugs instead of the INH for 6 months. But what is an abnormal xray? 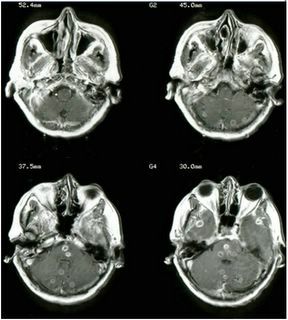 A cavitary lesion is obvious. What about apical scarring? Would you treat this as latent? 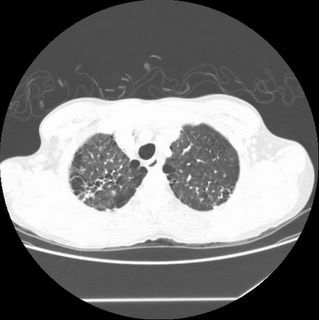 What about a nodule? 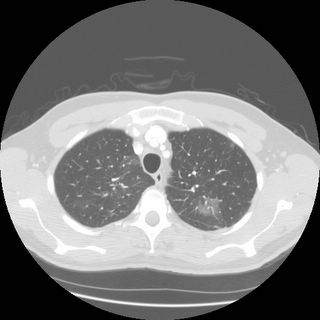 If your answer is that you would treat those as latent, then the utility of even obtaining a cxr is less; how many patients with active TB have no clinical signs of active TB? 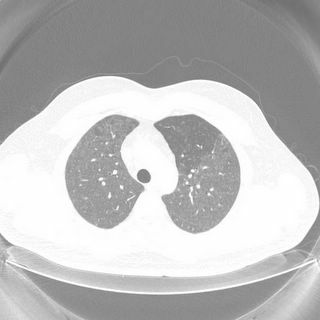 If your answer is that you would treat the +ppd apical scar patient as active, then you need to consider that apical scarring may represent previous exposure to TB but the body "dealt with it" and the result is some scarring. Isn't tht therefore considered latent? This is a 69 y/o man seen today in my office. He has very mild COPD (FEV1~75%) but continues to smoke. 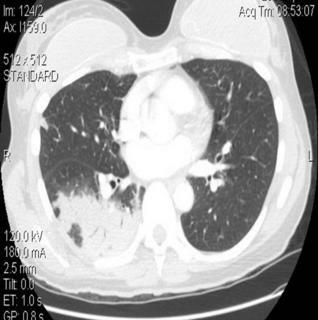 He had had some AECB and a CxR revealed some small pulmonary nodules. 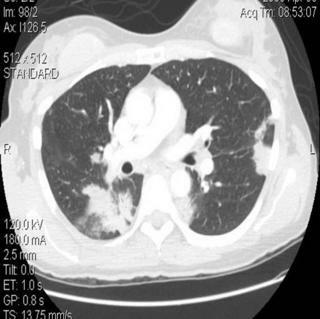 A CT scan (see below) confirmed B/L non-calcified, upper-lobe nodules (the two largest are seen on the CT slices below with no adenopathy and an adrenal mass. I bronch'ed him and found some chronic bronchitis but nothing endobronchial. 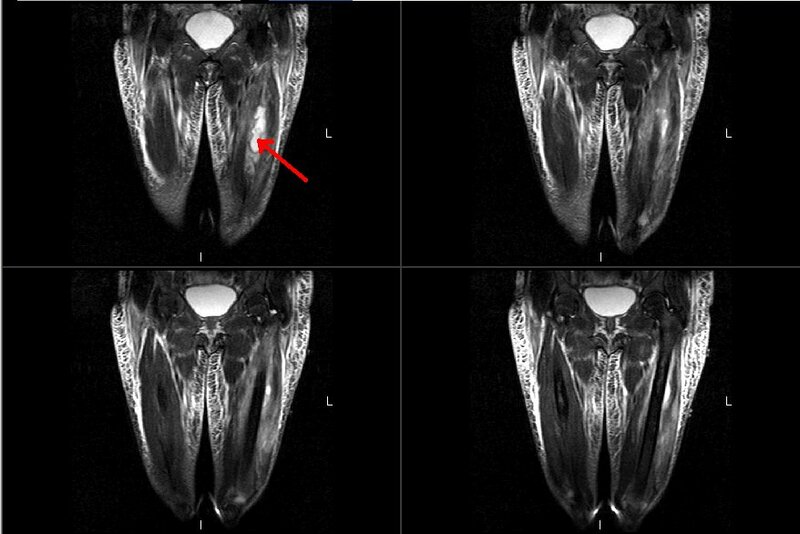 His TBBx and cyto (BAL and washings) were only significant for some inflammation. 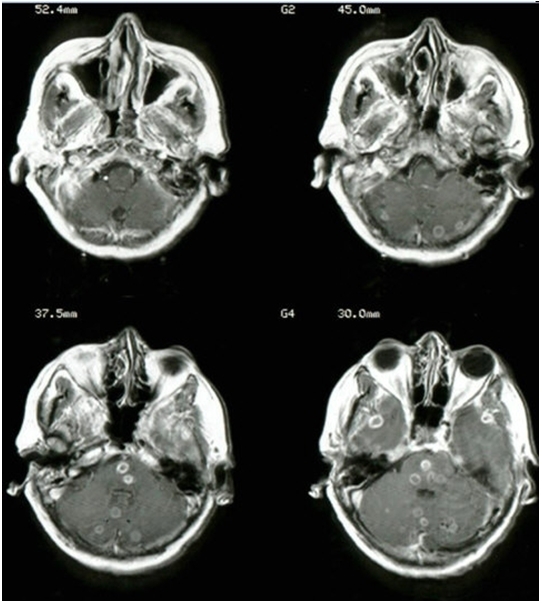 He is now assymptomatic and a PET scan showed no increased pathologic FDG-uptake anywher. What would you do next? Well, the patient received a biopsy of the brain lesion (I had offered bronch first but the primary ID team insisted on the neurosurgical approach). The result? Adenocarcinoma. Hello's not working (no "publish" button anymore), so the pics are stored elsewhere for this post. Anyway, what would you do with a 64 year old heavy previous smoker with mild/moderate emphysema with a lung nodule; here are 3 CT's. CT 2003. CT from March 2005. Here is this month's . Basically, there is a few mm size change c/w 2003, but no change compared with march 2005. The mediastinum has some unchanged calcified nodes. The nodule is not calcified but the cuts are only 5 mm. Now here is the thing. He is PPD positive and was exposed maybe back in the 50's. 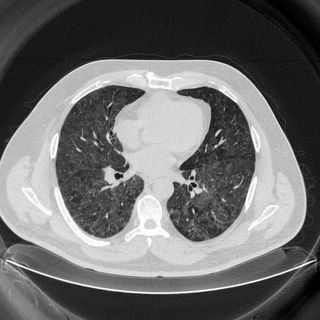 With that PPD history and the CT findings, BUT with a possibility of it being cancer also, how would you proceed? 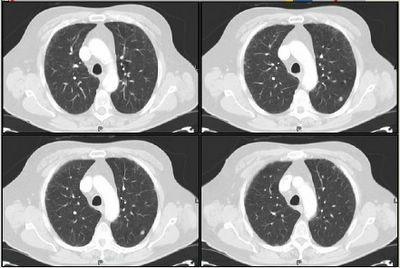 Are you worried about TB (but this wouldn't be "active" tb) or ignaore that and work up the nodule in the usual way when considering cancer? This is a real quick one. 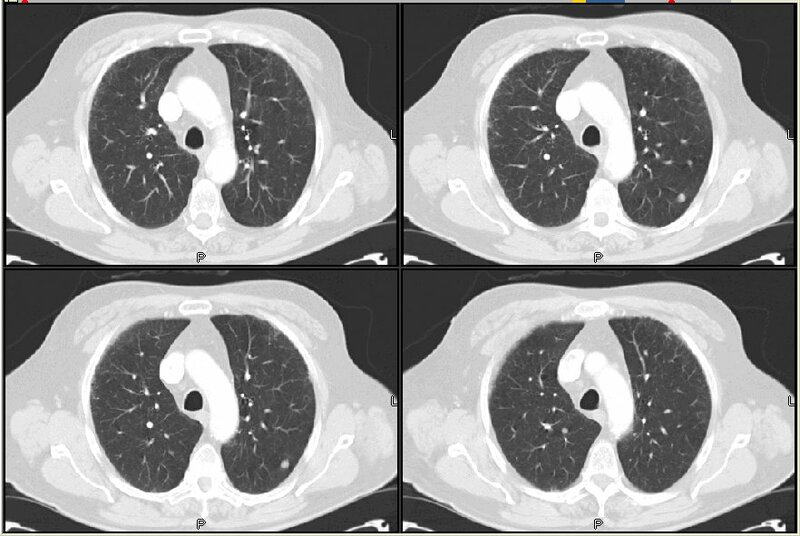 50 yo female with hilar/mediastinal adenopathy and a mild restrictive vent defect. 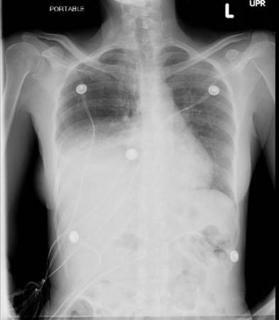 Clinical picture points to sarcoid. 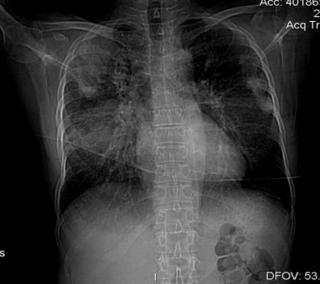 She has mild dyspnea on exertion. Bronch with TBBx, Wang needle performed. Her airways are edematous and inflammed, but not profoundly so. 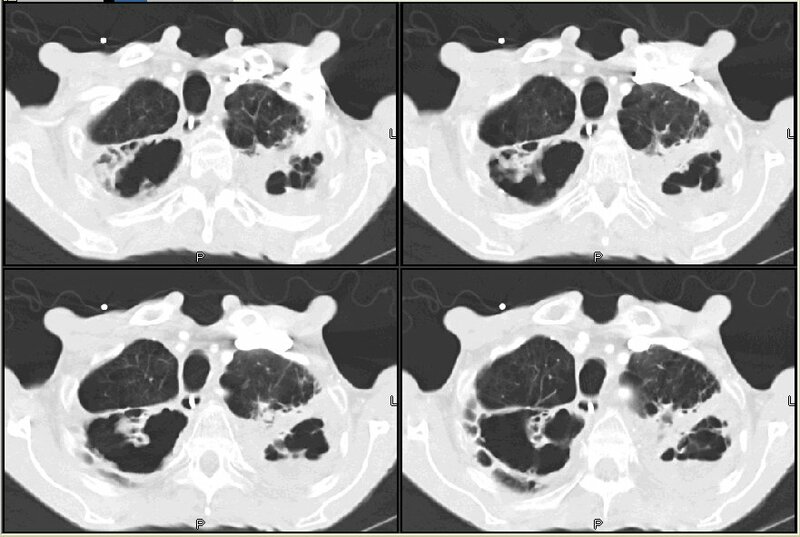 TBBx shows non-caseating granulomas and the Wang has granulomas as well (the 19 gauge needle is really wonderful). Anyway, the BAL culture shows Strep Pneumo (PCN sensitive). 52 y/o man with h/o substance abuse. 3 months of 25 lb weight loss. 3 weeks ago cough with scant white sputum. 2 days ago change in mental status. He came to ER and, because of the cough and the chest CT, he was admitted and isolated to r/o TB. .... Any comments on the CT? There are 2 findings, one on each slice shown above. Anyway, his cough was gone by the time of admission, and sputum could not be induced, so none could be sent. 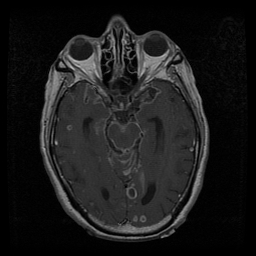 After they found him sitting in the closet, they got an LP and head MRI. LP was 22 wbc (49% L), RBC 6, gluc 51, protein 799. All micro negative (rpr,fungal,crypto,afb smear). Serum: HIV negative. What do you think and what would you recommend to the team as the next course of action? Kansasii and abscessus are seldom if ever colonizers and ought to be treated. 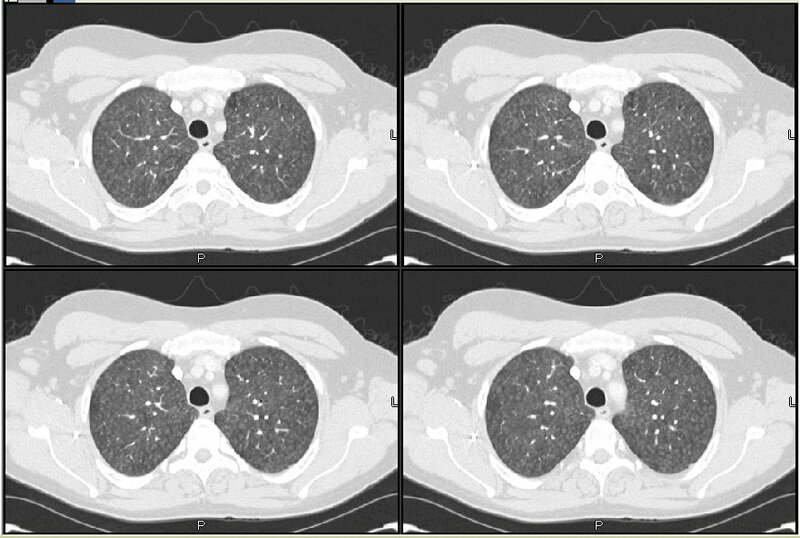 Have you been seeing a lot of NTM (besides MAC) in COPD? Any comments, opinions on our mini-epidemic? I had the same thoughts and concerns that have been outlined. Dan raised a good question on HIV status and PCP would also be a concern in a young man with subactue dyspnea and alveolitis. CBC was unremarkable and HIV and ANA were negative. I performed a bronch: PCP PCR was negative. 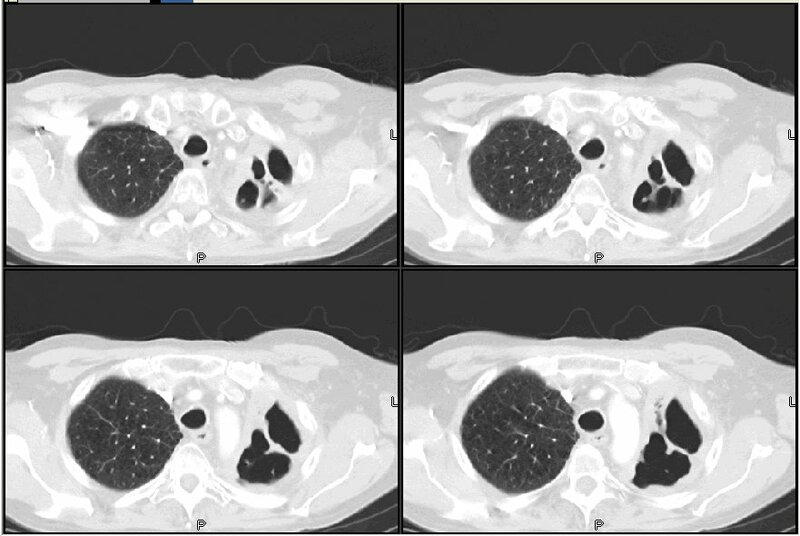 TBBx revealed a non-diagnostic pneumonitis. BAL did not look like PAP but had 72% Lymphs (the rest were Macs) with 91% of those being T-Lymphs with 60% CD8 cells. His HP pannel was positive for several molds including Cladosporium and Penicillium (which we incidentally grew from the BAL?) and mixed feathers. He gave away the birds and his family claned the barn while he was in the hospital. I did give him steroids to speed up resolution because he was pretty hypoxic. He has followed up in the office twice already: his D/C room air oxymetry was ~93% nad it is now 97%. His first FVC was 61% and that has come up to 75% and DLCO increased from 33% ro 66%. He feels better and he is back to work. With this BAL results and HP pannel, would you bother with any other diagnostic testing? I saw this patient again after his bronchoscopy and on more detailed questioning I discovered that he had a hot tub in his Karate studio and lived in the same building above his studio. He underwent a surgical lung biopsy which revealed: interstitial granulomatous pneumonitis. Special stains were negative for pathogens. The hot tub was removed from his home/studio and I offered him treatment with steroids which he declined. 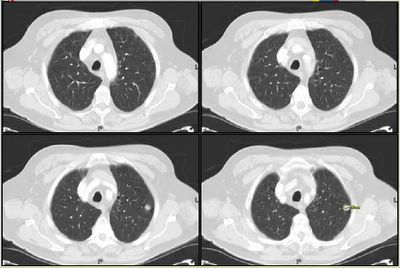 On 2 month follow up he had shown significant clinical improvement and some improvement in CT and DLCO. We again discussed treatment which he declined. 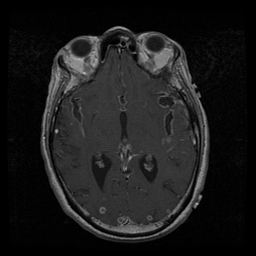 We were consulted on this previously healthy 39 y/o man. He works full time and for the past 6 weeks has had worsening new onset DOE. At his PCP's office he was hypoxic at rest and was sent to the ER where they first did a CT angio and then a CxR. There was no PE so he was treated with an ABTx and D/C'ed to see us as an outpatient. Before his appointment he became more dyspneic and was admitted and we were called. He is previously healthy. Has a dry cough, no fevers, chills, night sweats. He has some myalgias and arthralgias and dyspnea to minimal exertion. SHx: Smoked in the past but quit 2 years ago. He works as a mechanic and they live in a farm. He has outdoor goats and horses and two indoor cockatiels. He seems to remember that briefly before the onset of his dyspnea he opened a new bale of hay which was all moldy on the inside (not kidding). On exam he was AAOx3 in minimal distress. POx on room air at rest was 90%, dropping with exertion. He had bibasilar crackles and inspiratory squeaks throughout. Heart, abdomen and remainder of exam was normal. What would you do next? What other info would you want? What do you do with a sarcoid patient (lets say stage 1) where a routine EKG shows LBBB. She is asymptomatic. Let me ask you a question. I come across these patients all the time. 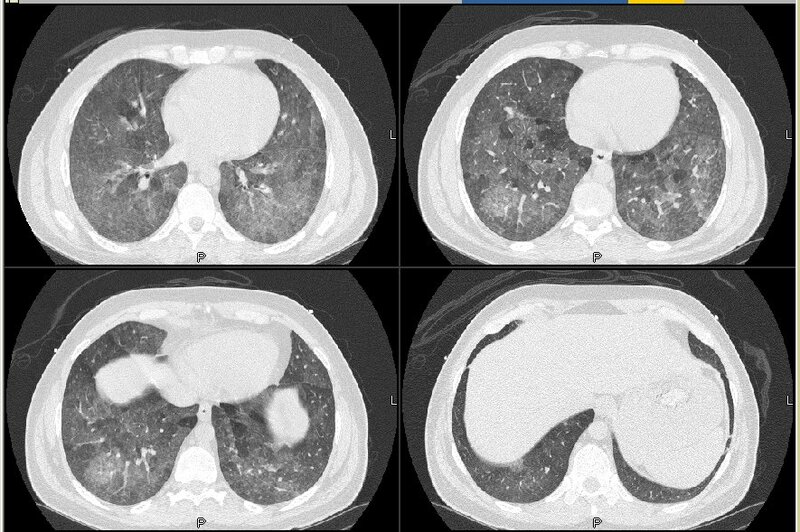 You get a patient with a few tiny nodules on CT, picked up incidentally. Even though you know deep down they are benign, are you obligated to follow them out to 2 years? 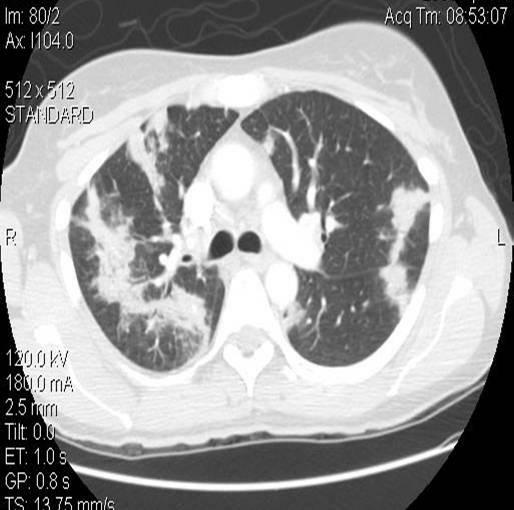 I have a CT from 12/04 and a CT from 6/05 with no change in these little nodules. She is a nonsmoker so I thik I'm done... BUT even if she is a smoker, do we HAVE to follow these things out to 2 years? I mean what do you *actually* do, now that you are an attending/in real world and it's your neck on the line. Sorry it took so long to update this case. 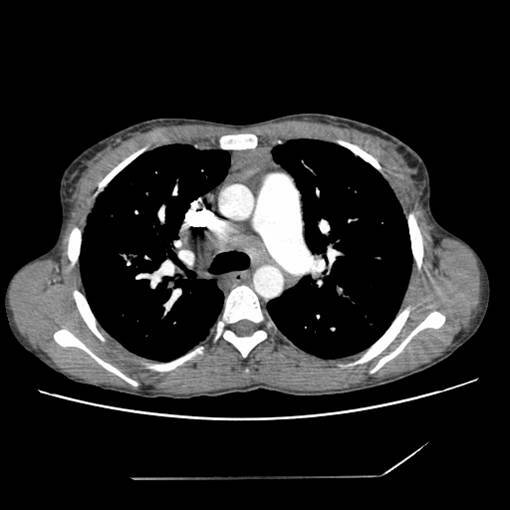 This was the 40-year old woman with abdominal pain and pleural effusion. months. Sx. tend to wax and wane. States that becomes SOB after walking approximately 200 ft. Also becomes quite dyspneic with stairs. Gave up martial arts 8 months ago due to dyspnea. 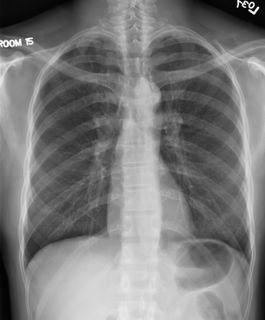 Denies cough, occasional sputum and no hemoptysis. Denies fevers/chills/sweats, rash, joint pains/stiffness. Recent travel only to China approximately 1.5 yrs ago. Has had a recent negative HIV test. Denies unintentional wt. loss. Denies new drugs or exposures. Recent normal nuclear stress test. Soc hx: former karate instructor, on disability for closed head injury. No tobacco, etoh, ivda. Lives on 10 acres in Howell, MI, no farm animals, has a dog. No gardening or working in soil. No exposures w/ hobbies. No abnormal findings on focused exam. 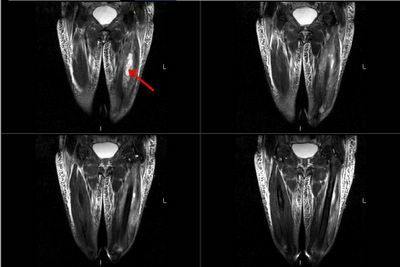 TBBx: focal interstitial fibrosis, collections of alveolar macrophages and chronic inflammation. No malignancy. Negative for proteinaceous alveolar deposits. 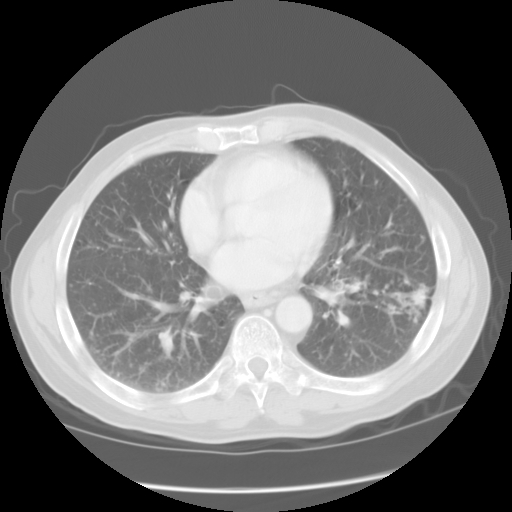 What is your DDx and how would you proceed? 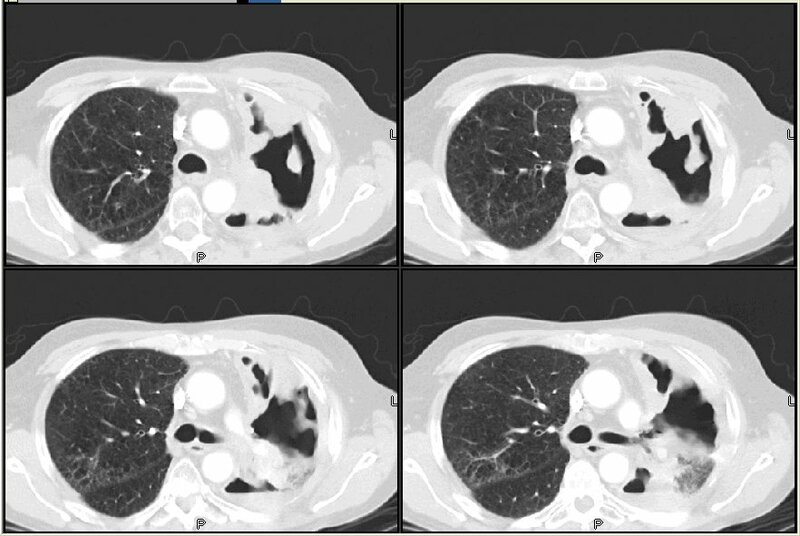 This is a new question on a patient I have posted here before (PCN allergy) : this is 55 y/o man with stage IIIB bronchogenic Ca, S/P xRt and chemo. He also has mild COPD and had done fairly well with Chemo/radiation. He is ~8 months since the initial Dx and ~3 months since his last chemo. 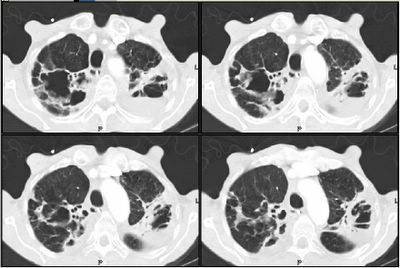 He presented with fevers, SOB and cough productive of thick purulent sputum and had a LUL infiltrate with sputum Cxs positive for MDR Pseudomonas aeruginosa. Imipenem and APAG had the best MICs though it was also SS to Pip/Tazo (resistant to everything else. Susceptibility profile has remained the same. Would you add or change anything at this point? This is regarding the patient with the persistent RML abnormality (part 1, part 2,) who came in with empyema and infected RML. 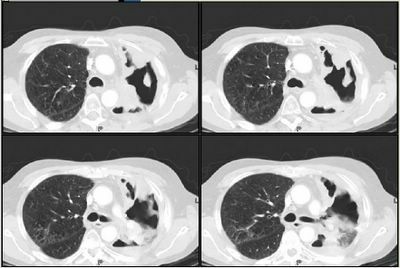 After "cooling things down" with a few days of ABTx he improved and underwent a RMLobectomy: most of the RML was an inflamed cystic pus-filled space. In its very center was an adenocarcinoma (T2). Cytokeratin subtype immunostaining favors a primary lung adeno. The path on all the nodes revealed 1 positive node at a N1 station. 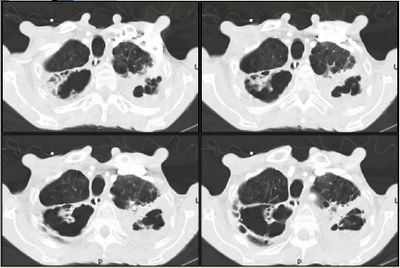 All other nodes and all margins were tumor-free. He is being D/C'ed home on ABTx and will follow up with us and oncology to decide whether he wants adjuvant Tx for his stage IIB tumor. I will try and get some path pictures and post them at a later point. 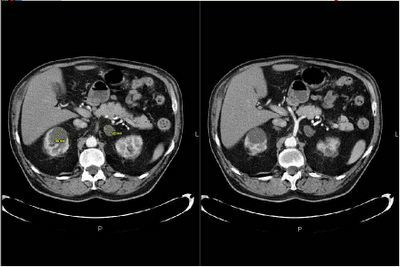 Have you been more aggressive at recommending adjuvant Tx for lower-stage disease? Social: 16 pack year smoker-quit 2.5 years ago. + h/o cocaine use (smokeing and snorting), none for the past 10 years. + Heavy ETOH use, but quit a few months ago when he was told to stop because of "abnormal liver tests." PE: Tall and thin. Mild wheezing and prolonged expiratory phase. Otherwise unremarkable. FEV1 of 2.6 L, which is 59% of predicted. FVC is 6.55 L, which is 117% of predicted. His pulse oximetry is 98% on room air at rest. The flow-volume loop is curved. His exhalation time was 9 seconds. Decision to test is a decision to treat? This is a short case concerning a young man referred to my clinic after undergoing his pre-University physical/health screen. 18 year old young man presented to his PCP about one month prior to his first semester of college. His history was unremarkable and no abnormalities were found on exam. The young man's mother asked the physician to place a PPD. Three days later his PPD was read as indurated at 55 mm. A PA/LAT was normal. He was in our clinic about one week into his studies. Again, completely unremarkable history and exam. No TB risk factors. CXR negative. I think we can handle 2 posts on the same day, given that they are both short. Plus, I do want to get your thoughts on what you would do with this patient. 56 y/o AA man with no Pmhx. In January he developed the flu and since then has chronic cough, scant white and now yellow sputum. More recently also with some nasal congestion with post nasal drip. He saw a PCP who got PFT's that showed mild obstruction (normal DLCO) and gave him albuterol, doxy and prednisone which made him feel somewhat better. On social, minimal smoking - 12 pack-yrs, quit 9 years ago. Nothing occupationally. Labs showed WBC 5 with 39% N, 36% L and 19% eos.